Bundled up against the harsh January cold, Albany Mayor Kathy Sheehan is joiined by community members and government officials in observance of MLK Day. The annual New York State Dr. Martin Luther King Jr. holiday ceremony ends with the "Beloved Community March" from Albany’s Empire State Plaza to the King Monument in Lincoln Park. Contemporary politics dominated this year's march. The gathering commemorating the 50th anniversary of Dr. King's death came days after President Trump’s disparaging comments about Haiti and Africa. Although she didn't refer to Albany as a "Sanctuary City," Mayor Kathy Sheehan reiterated City Hall's stance. "And whether you come here from Africa, from Haiti, from South America, from El Salvador... where are you all from? Syria! We have people here from Afghanistan. We have people here from all across the globe. And we have people who are descendants of those who were brought over here on ships." Fellow Democrat Congressman Paul Tonko told those assembled the effects of Dr. King’s activism continue to be felt today. He shared that he was extremely disturbed by President Trump’s words. "When you can denounce nations and their people. When you can discredit in vulgar terms. Words can hurt. And we need to tell our leaders 'please choose your words carefully and lovingly.' It moved me to tweet the president, and to say 'Mr. President, behavior like this is demeaning to the office of the presidency. It is unacceptable." 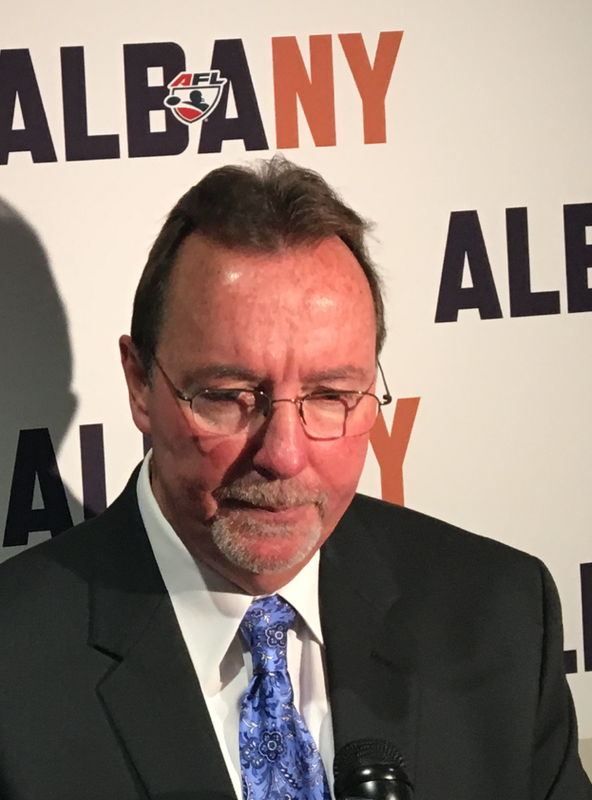 Albany County Executive Dan McCoy noted "a couple of things" he would like to say. "Just for a day, walk in the steps of Dr. King. Just for a day, Mr. President, and see what he went through. Also, when you're down in your Trump Plaza, go out to the Statue of Liberty and just see what's inscribed on the Statue of Liberty. What we stand for. Because we're all immigrants. And we're all one." Tonko asked that Trump apologize. "To the people he had hurt, the nations he had disrespected, and to all of us. Because when one amongst us hurts, we all hurt." 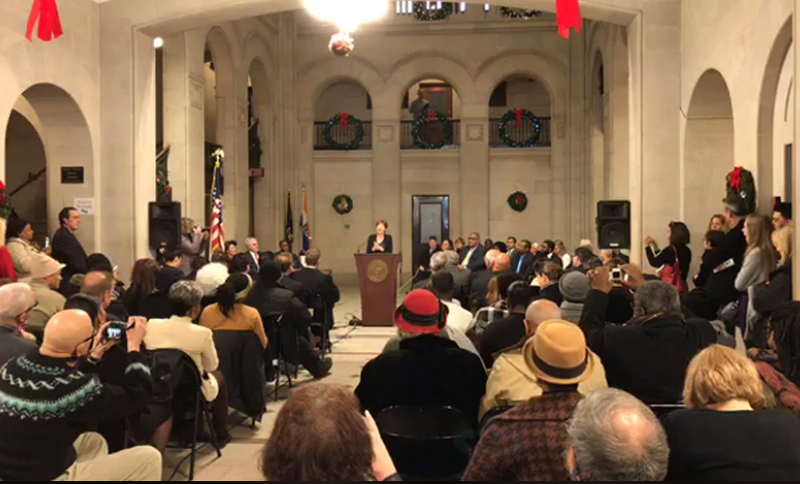 Mayor Sheehan took perhaps the most poignant poke at Washington: "When slaves were brought over here, we weren't saying 'we don't want people from Africa,’ were we? No! No, of course we weren't. We are better than that. We need to hold our heads high, and we need to speak truth to power. We cannot forget. This struggle is not over. As long as you can speak racist words and be in the White House, this struggle is not over." Benediction was offered by Reverend Craig Thomas Robinson of Albany's First Israel AME Church: "Send a special blessing over Washington, and that those who continue to traffic in bigotry will begin to see a better way. This is our prayer." The finishing touches are being put in place on the Times Union Center's $19.6 million renovation.